Being in the industry for as long as we have, we know what to do to get the most out of your automated garage door. We encourage all of our clients to perform simple and regular cleaning and maintenance tasks to increase its longevity. Luckily for you, we’re experts in the field of maintenance. We have plenty of experience and this shows in our quality workmanship and technical knowledge. We’ll fix any problem that your garage door or opener has, and we’ll do it in a professional way! Your electric opener is essential for experiencing the modern convenience of an automated garage door. There are many different, well-known brands out there, and we can fix, and help you look after, whichever model you have at home. When it comes to your opener system, there are a few areas to be aware of - for example, your safety sensors should be checked regularly for functional issues and your chain drive (if you have this type of system) should be lubricated to prevent rust and friction. Whether your garage door’s roller wheels are plastic, steel or nylon, we can inspect these components and advise as to whether any of them need replacing. Leaving just one faulty roller in place can seriously, and negatively, harm the overall functionality of your automated garage door. 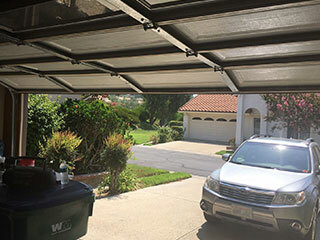 Your electric garage door is extremely heavy, whether it’s made of steel, wood, glass or aluminum. Your springs are responsible for the opening and closing of your system and have a hard job to do. They should be checked periodically for wear and tear and balance issues. During a maintenance visit, we can apply any necessary lubrication and make tension adjustments as needed. Give us a call today for more information regarding our maintenance services or to arrange an appointment with one of our expert technicians at Garage Door Repair Winter Garden.